A type of quick bread made from sweet, ripe bananas, banana bread is irresistibly moist and delicious. Banana bread is simple to make, but proper cooling is important, because the bananas caramelize and become sticky during the cooking process. As a result, the bread can be difficult to remove from the pan. Bread that is cooled too long or not long enough may emerge in pieces instead of smooth, lovely loaves. Remove the banana bread from the oven. Place the bread -- in the pan -- on a sturdy surface and allow it to cool for 15 minutes. This cooling period allows steam to condense, which makes the bread easier to remove from the pan. Invert the pan with one hand and use your other hand to guide the bread from the pan. Use pot holders; the pan will still be hot. If the bread doesn't come out easily, slide a thin metal spatula or knife carefully around the inner edge of the pan to loosen the bread. 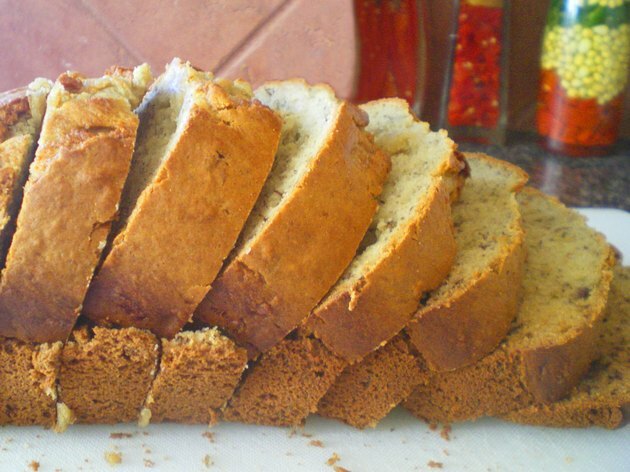 Place the banana bread on a wire baking rack and allow it to cool completely before slicing, eating or storing. Place the cooled banana bread in a plastic bag or airtight container and store it at room temperature. If you don't plan to use the bread within a week, place the bread in an airtight container or resealable plastic bag and store it in the freezer. Let the bread thaw at room temperature for 90 minutes before using. If the bottom of the banana bread sticks and the bread won't come loose from the pan, place the pan in about 1/2 to 1 inch of hot water for 3 or 4 minutes. The loosened bread should slide easily from the pan. Does Toasting Bread Change Its Nutritional Value?